BMW brings xDrive all-wheel drive to the 5-series. Previously this technology was available in BMW’s X3 and X5 SUVs. BMW brings xDrive to the 5-series, targetted at countries with winter climates. All Wheel Drive has been very popular with premium sedan makers these days. Audi has Quattro, Mercedes Benz has 4Matic. The Lexus GS300 has it. The Infiniti M35 has it. xDrive is electronically controlled and uses a multiplate clutch for infinite variation of front-back wheel power ratios. The system ordinarily sends 40 percent of the torque to the front, but power is slowly shifted to rear-wheel drive as speeds rise from 100-125 mph for improved steering feel. The system works together with BMW’s Dynamic Stability Control (DSC) system. It adjust the distribution of power using data taken from the yaw rate and steering angle sensors. The option will be an additional USD$2000 on the 5-series sedans but it will come standard on the 5-series sports wagon. 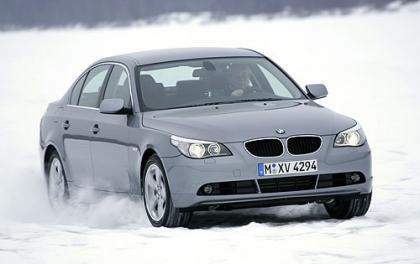 There is currently no plans to install xDrive All Wheel Drive on the 545i V8 sedan. The 525xi and 530xi has a 2.5 litre and 3 litre magnesium-aluminium six-cylinder engine respectively. The 5-series sports wagon will only be available as a 530.